It is plain to see that Chapel Hill isn’t full of church shoppers who come to us. Visitors to St. Benedict’s are, most often, from out of town, worshiping with us during a family visit. It is good that we make efforts, for example putting out door hangers. Nonetheless, it is important to know that the churches that grow in number do so mostly because church members (i.e. folks like you) invite people to come. Evangelism is the mission of the Church, and being a witness for the Lord Jesus Christ is the calling of every Christian. From the four Gospels we can see that this charge has come to us from no less then the Risen Christ Himself. So, again I will publish for you a version of the Prayer for Church Growth that you may use at home. While saying this prayer, among your daily prayers, I ask you to seek and to be open to your own opportunities and of the leading of the Holy Spirit. O God and Father of our Lord Jesus Christ, Whose will is that none should perish, and Who hast given us gifts by thy Holy Spirit to do thy will on earth, By the power of the same Holy Spirit make us always true and living witnesses for thy Son, our Lord Jesus Christ; And so guide us and use us to bring people into thy holy church. 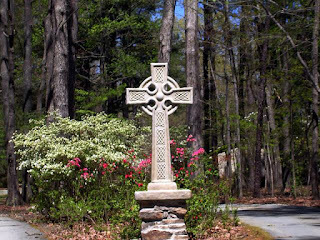 Grow this parish in Chapel Hill that is named in honor of thy saint Benedict. Make us a light to the world around us. Draw people to our parish that they may partake of Christ and His salvation in our fellowship. And Father, Direct us in all our doings, with thy most gracious favor, and further us with thy continual help; that in all our works begun, continued, and ended in thee, we may glorify thy holy Name, and finally, by thy mercy, obtain everlasting life; All of this we pray through Jesus Christ our Lord. Amen. On October 22, Archbishop Haverland will be with us. The service will be for the Nineteenth Sunday after Trinity. The 10:00 AM Holy Communion will be followed by a potluck luncheon. The word which came to Jeremiah from the LORD, saying, Arise, and go down to the potter's house, and there I will cause thee to hear my words. Then I went down to the potter's house, and, behold, he wrought a work on the wheels. And the vessel that he made of clay was marred in the hand of the potter: so he made it again another vessel, as seemed good to the potter to make it. Then the word of the LORD came to me, saying, O house of Israel, cannot I do with you as this potter? saith the LORD. Behold, as the clay is in the potter's hand, so are ye in mine hand, O house of Israel (Jeremiah 18:1-6). 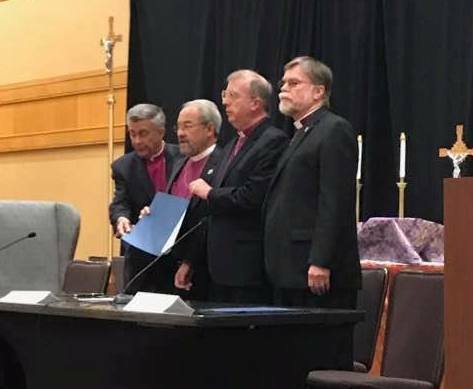 On October 4-6, the Anglican Diocese of the Holy Cross (DHC), the Anglican Province in America (APA), the Anglican Church in America (ACA), and the Anglican Catholic Church (ACC) came together in Atlanta Georgia. Each jurisdiction held the business sessions necessary to a provincial synod separately, inasmuch as those meetings are about all sorts of specific things, many of which are put to a vote, some involving budgets, etc. But the spiritual and social activities, from church services to meals, were all held together. On the last day of the gathering, Friday October 6, all synod business having been concluded, everything was done together. In the morning, the four leading bishops signed the agreement for full communion. This was followed by a man in the crowd calling out "Praise God!" and a spontaneous rendering, sung by all of us, of the Doxology. 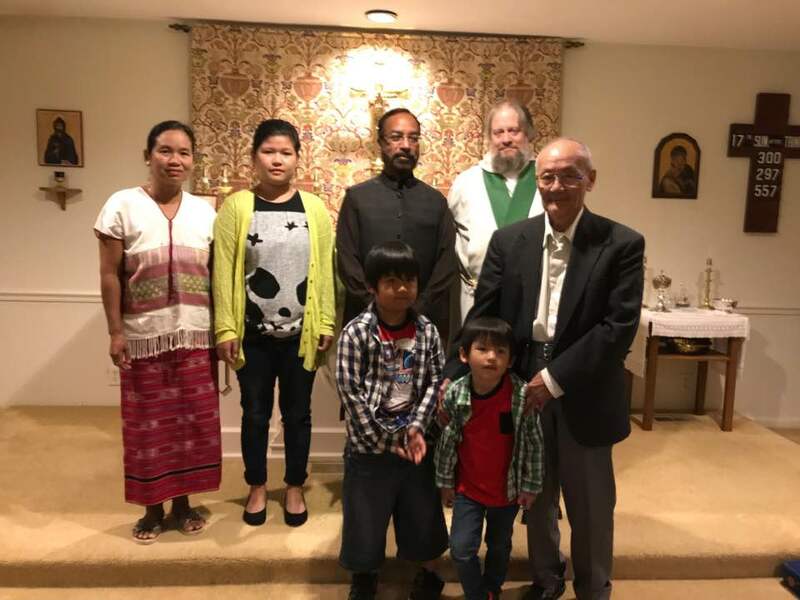 A little bit later the four jurisdictions held a Mass together. The four leading bishops are pictured above, from left to right, the Rt. Rev. Paul Hewitt (DHC), the Most Rev. Walter Grundorf (APA), the Most Rev. Dr. Mark Haverland (ACC), and the Most Rev. Brian Marsh (ACA). 10:00 AM Holy Communion with Sunday school for children in the parish hall.